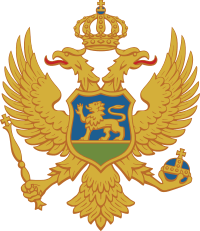 The Principality was formed on 13 March 1852 by Danilo I Petrović-Njegoš, when the latter, formerly known as Vladika Danilo II, decided to renounce to his ecclesiastical position as prince-bishop and married. With the first Montenegrin constitution being proclaimed in 1855, known as "Danilo's Code". After centuries of theocratic rule, this turned Montenegro into a secular principality. Grand Duke Mirko Petrović, elder brother of Danilo I, led a strong army of 7,500 and won a crucial battle against the Turks (army of between 7,000 and 13,000) at Grahovac on 1 May 1858. The Turkish forces were routed. This victory forced the Great Powers to officially demarcate the borders between Montenegro and Ottoman Turkey, de facto recognizing Montenegro's centuries-long independence. Montenegro gained Grahovo, Rudine, Nikšić, more than half of Drobnjaci, Tušina, Uskoci, Lipovo, Upper Vasojevići, and part of Kuči and Dodoši. The glory of the Montenegrins was soon immortalized in songs and literature of all South Slavs. 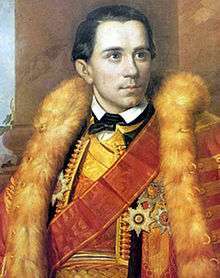 After the assassination of Knjaz Danilo on 13 August 1860, Knjaz Nikola I, the nephew of Knjaz Danilo, became the next ruler of Montenegro. Nikola sent aid to the Serb rebels in the Herzegovina Uprising (1875–78), and then led a war against the Ottomans, the Montenegrin–Ottoman War (1876–78). The advancement of Russian forces toward Turkey forced Turkey to sign a peace treaty on 3 March 1878, recognising the independence of Montenegro, as well as Romania and Serbia, and also increased Montenegro's territory from 4,405 km² to 9,475 km². 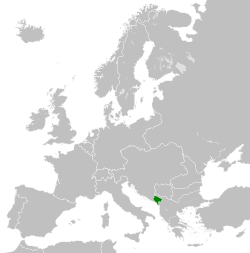 Montenegro also gained the towns of Nikšić, Kolašin, Spuž, Podgorica, Žabljak, Bar, as well as access to the sea. This was the Great Powers' official demarcation between Montenegro and the Ottoman Empire, de facto recognizing Montenegro's independence; Montenegro was recognized by the Ottoman Empire at the Treaty of Berlin (1878). Under the rule of Nikola I, diplomatic relations were established with the Ottoman Empire. Minor border skirmishes excepted, diplomacy ushered in approximately 30 years of peace between the two states until the deposition of Abdul Hamid II. 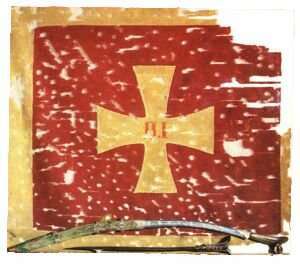 The historical war flags were the krstaš-barjak, plain flags with crosses in the centre. The Montenegrin war flag used in the Battle of Vučji Do (1876) was red with a white cross patty in the centre and a white border, and this flag was adopted from the Serbian war flag in the Battle of Kosovo (1389) which found itself in Montenegro after surviving knights brought it there. The same flag was used in Cetinje in 1878, upon recognition of independence by the Ottoman Empire at San Stefano. According to the 1905 constitution, the national flag was a tricolour of red-blue-white ("црвена, плаветна и бијела"), which was the Serbian tricolour. The Metropolitans of Cetinje were: Ilarion Roganović (1876-1882), Visarion Ljubiša (1882-1884) and Mitrofan Ban (1884-1918). ↑ Stvaranje, 7–12. Obod. 1984. p. 1422. Црне Горе и Брда историјска стварност коЈа се не може занема- рити, што се види из назива Законика Данила I, донесеног 1855. године који гласи: „ЗАКОНИК ДАНИЛА I КЊАЗА И ГОСПОДАРА СЛОБОДНЕ ЦРНЕ ГОРЕ И БРДА". ↑ Čedomir Popov. Istorija srpske državnosti: Srbija i Crna Gora : novovekovne srpske države. Srpska akademija nauka i umetnosti. p. 254. ↑ Ivanović (2006), Problematika autokefalije Mitropolije Crnogorsko-primorske, Крсташ-барјак, познатији као вучедолска застава, је у ствари косовски крсташ-барјак, који су преживјели косовски витезови донијели у Црну Гору послије боја на Косову. ↑ Nenadović, Ljubomir P. (1929). O Crnogorcima: pisma sa Cetinja 1878. godine, Volume 212 (in Serbian). Štamparija "Sv. Sava,". p. 187.